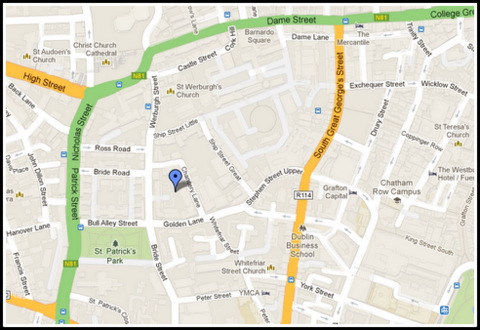 The earliest remains of a road thus far discovered in Dublin city was found during an archaeological excavation carried out by Claire Walsh in the vicinity of Golden Lane and Chancery Lane[i]. Although truncated in parts, the road was extensive, measuring at least 50 m in length and extending across two separate sites. Approximately 2.35 m in width, it was located within a shallow cut and its surface was defined by a tightly packed metalled surface. This was composed of both sub-rectangular and rounded stones set directly into natural boulder clay. These had been deliberately thrown down to make a dry, compact road surface. The western side of the road was partially defined by a drainage gully while the eastern edge was demarked by an intermittent sequence of drainage gullies and fence postholes. The road surface was overlain by a thick deposit of grey soil, which contained frequent inclusions of butchered animal bone, a fragment of which was broadly radiocarbon dated to the 9th century AD. This deposit appears to represent plough soil mixed with dumped domestic waste and it suggests that road had gone out of use by the mid-9th century[ii] . At least three burials were identified immediately to the west of the road, two of which represented the remains of children. They appeared to have been interred in a Christian manner, with the graves orientated east-west and the bodies wrapped in burial shrouds. Why then they were buried in unsanctified ground, on the edge of a road, remains uncertain, especially considering that a number of early ecclesiastical sites were located close by. Additional features found to the west and east of the roadway included a number of truncated metalled surfaces, some associated with metalworking, as well as fence lines, pits and possible structural outlines. 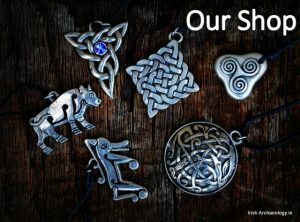 These suggest that people were living and working in this part of Dublin prior to the arrival of the Vikings in 841 AD. 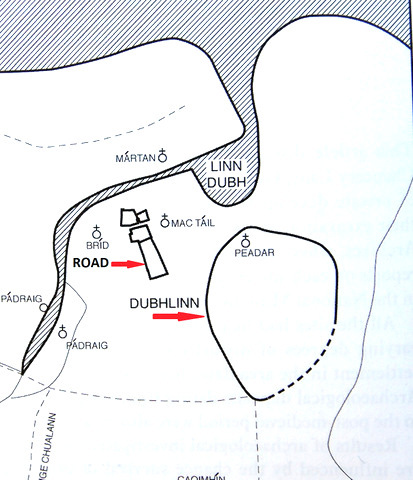 It is possible that this activity was related to the nearby monastery of Dubhlinn (black pool). This early ecclesiastical site, which was named after a tidal pool on the River Poddle, is the source of the modern city’s name (Dublin). It is first mentioned in the Annals of the Four Masters in 650 AD, when St. Bearaidh is recorded as its abbot[iv]. 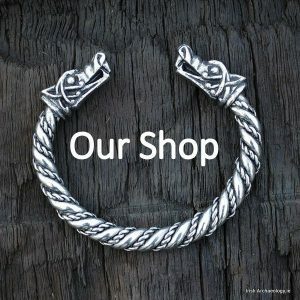 It disappears from the written record during the 9th century, probably as a direct consequence of plundering raids, emanating from Dublin’s newly established Viking longphort (a type of Viking fortress). 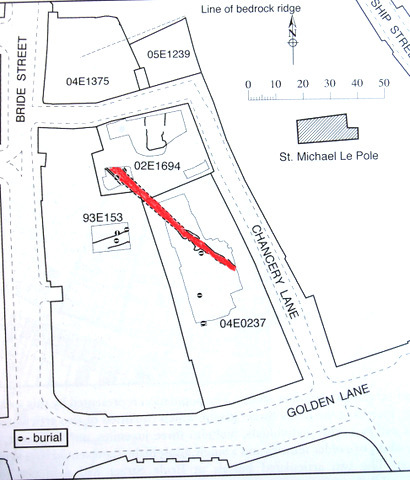 The former location of the monastery is suggested by a distinctive curvature seen in a number of city centre streets including, St Peter’s Row, Whitefriar Street, Stephen Street Upper & Lower, and Johnson’s Place[v]. The outline of these streets suggests the former presence of a large sub-circular enclosure, something which is characteristic of early monastic sites[vi]. It is likely that the Early Medieval roadway led away from the northeastern edge of this monastery towards a fording point on the River Poddle[vii]. It is not difficult to imagine it being used by monks and pilgrims as they travelled to and from Dublin’s early ecclesiastical centre. Little did they know, as they walked along its stony surface, that soon everything would change utterly. Their monastery would disappear beneath the slashing swords of ship borne warriors from the north, and a great Hiberno-Norse city would take its place. One Dublin died and another was born. [v] Clarke, H. B. 2002 Irish Historic Towns Atlas, No 11, Dublin, Part I, to 1610. Dublin: Royal Irish Academy. [vi] It has also been suggested that site of the medieval Church of St. Michael le Pol (St. Michael of the Pool), may have been the location of the Dubhlinn monastery. This church was located immediately to the east of the roadway under discussion and contained a number of early features. 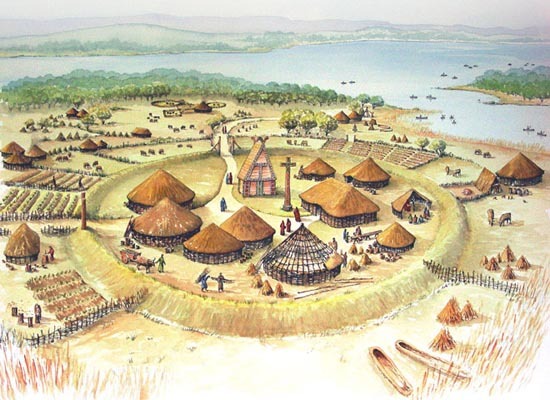 These included pits, postholes and burials that were radiocarbon dated to the early medieval period, as well as a round tower, which is an architectural feature often seen at monastic sites.